Gary Hoffer’s grandfather was in the Army in WWI and his uncle was a Marine in WWII. When Gary signed up for the Navy after high school, he represented the next generation in this family of veterans. Of course there was a draft, so that was also an incentive to join the military, but Gary says he probably would have joined anyway. “Recruit” Gary began his six-week boot camp in San Diego, California in March of 1969. He was assigned to Company 200 and, coincidentally, it was the 200th birthday of the city of San Diego. The Company found itself privileged, and among other benefits had pictures taken with Miss San Diego. Boot camp routines were less impressive … classes inside and classes outside included rifle, tear gas, swimming (required for all Navy recruits) and, of course, marching. After boot camp and a five-day leave, Gary reported to his first ship, the USS Kitty Hawk. It was an aircraft carrier with over 5,000 men aboard assigned to West PAC deployments and to Vietnam. 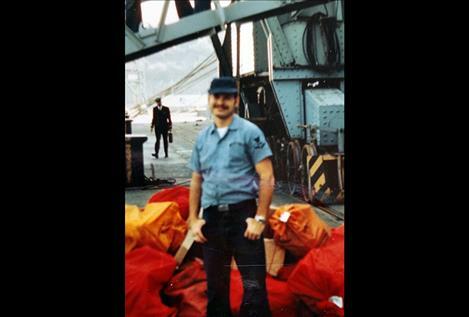 Gary was a postal clerk for the ship, loading and unloading mailbags off C2 planes up on the flight deck and carrying them down a few decks to the post office, walking around carts of 500-pound bombs. His job included selling money orders for guys to pay bills back home or stash their pay in a safer form than cash. He handled as much as $90,000 in brand new bills, and he handled them carefully since any errors came out of his pocket. In July of 1979 Gary got emergency leave and flew from the Kitty Hawk to Da Nang, Vietnam and then back to the U.S. because his brother had been killed in a motorcycle accident. This was one of the most terrible times in his life. Only with family, friends and faith did he make it through the tragedy. When the Kitty Hawk returned to San Diego, Gary spent a month there and then sailed up the Pacific coast to Bremerton, Washington Naval Ship Yards where the Kitty Hawk was dry docked. Gary returned to San Diego, trained at postal clerk school and was assigned to the USS Lyman K. Swenson, a destroyer – also called a “tin can.” There were only 250 men aboard this small ship. It was on its last deployment to Vietnam, off the coast on carrier patrol for the Mekong River and Da Nang. He began this tour of duty clerking in the postal department. Since he was the only one, you might say he was the head clerk. He also worked below decks loading the guns. He didn’t find it too claustrophobic but it was hot, cramped and noisy. Luckily it never affected his hearing. There were Army swift boats and helicopters spotting and letting them know where and how their 5-inch diameter guns hit the targets. At the end of that deployment the men were treated to port of call for the World’s Fair in Osaka Japan. “I never saw so many people in my life!” This was the high point of Gary’s Navy days. He remembers the colorful umbrellas in rainy Japan. After returning again to San Diego, the Swenson was decommissioned and Gary got orders to join the USS Samuel Gompers which repaired destroyers. There were about 1,000 men on this ship. They were in port most of the time but did go on a West PAC deployment for nine months in 1971-1972. They were in Da Nang, South Vietnam twice. Gary worked again as a postal clerk. The crew spent time working on destroyers before heading to Subic Bay, Philippines with stops in Hong Kong and Kashong, Taiwan. Gary was a short timer by then and applied for an early out to attend college. He had qualified for a promotion to E-5 but would have had to extend six months to actually get it, so he went out as an E-4. Gary never made it to the east coast or Australia, which he would have liked to do; but overall, he’s satisfied with his time in the service. He thinks a Navy career would only be good if the person were single. He wouldn’t advise women in the Navy to serve on board ship. Military service would be good for young people today to help pay for college and for the camaraderie. Gary belongs to the DD-729 Sailors’ Association and last year finally was able to attend a reunion with others who served on the Swenson. 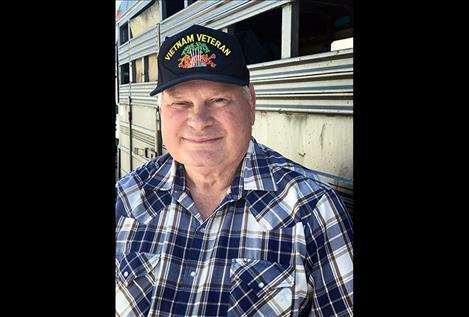 His picture in the program booklet says, “Gary Hoffer, First Timer.” As a first-timer, Gary got to sit behind the bus driver on their tours, and help handle the flag during the memorial service. As a footnote, Gary’s son served in the Army in Iraq, adding a fourth generation to this wonderful family of veterans. Thank you for your service, Gary.